THE situation of American literature is anomalous. It has no centre, or, if it have, it is like that of the sphere of Hermes. It is divided into many systems, each revolving round its several suns, and often presenting to the rest only the faint glimmer of a milk-and-water way. Our capital city, unlike London or Paris, is not a great central heart from which life and vigor radiate to the extremities, but resembles more an isolated umbilicus stuck down as near as may be to the centre of the land, and seeming rather to tell a legend of former usefulness than to serve any present need. Boston, New York, Philadelphia, each has its literature almost more distinct than those of the different dialects of Germany; and the Young Queen of the West has also one of her own, of which some articulate rumor barely has reached us dwellers by the Atlantic. That no certain augury can be drawn from a poet’s earliest lispings there are instances enough to prove. Shakespeare’s first poems, though brimful of vigor and youth and picturesqueness, give but a very faint promise of the directness, condensation and overflowing moral of his maturer works. Perhaps, however, Shakespeare is hardly a case in point, his “Venus and Adonis” having been published, we believe, in his twenty-sixth year. Milton’s Latin verses show tenderness, a fine eye for nature, and a delicate appreciation of classic models, but give no hint of the author of a new style in poetry. Pope’s youthful pieces have all the sing-song, wholly unrelieved by the glittering malignity and eloquent irreligion of his later productions. Collins’ callow namby-pamby died and gave no sign of the vigorous and original genius which he afterward displayed. We have never thought that the world lost more in the “marvellous boy,” Chatterton, than a very ingenious imitator of obscure and antiquated dulness. Where he becomes original (as it is called), the interest of ingenuity ceases and he becomes stupid. Kirke White’s promises were indorsed by the respectable name of Mr. Southey, but surely with no authority from Apollo. They have the merit of a traditional piety, which to our mind, if uttered at all, had been less objectionable in the retired closet of a diary, and in the sober raiment of prose. They do not clutch hold of the memory with the drowning pertinacity of Watts; neither have they the interest of his occasional simple, lucky beauty. Burns having fortunately been rescued by his humble station from the contaminating society of the “Best models,” wrote well and naturally from the first. Had he been unfortunate enough to have had an educated taste, we should have had a series of poems from which, as from his letters, we could sift here and there a kernel from the mass of chaff. Coleridge’s youthful efforts give no promise whatever of that poetical genius which produced at once the wildest, tenderest, most original and most purely imaginative poems of modern times. Byron’s “Hours of Idleness” would never find a reader except from an intrepid and indefatigable curiosity. In Wordsworth’s first preludings there is but a dim foreboding of the creator of an era. From Southey’s early poems, a safer augury might have been drawn. They show the patient investigator, the close student of history, and the unwearied explorer of the beauties of predecessors, but they give no assurances of a man who should add aught to stock of household words, or to the rarer and more sacred delights of the fireside or the arbor. The earliest specimens of Shelley’s poetic mind already, also, give tokens of that ethereal sublimation in which the spirit seems to soar above the regions of words, but leaves its body, the verse, to be entombed, without hope of resurrection, in a mass of them. Cowley is generally instanced as a wonder of precocity. But his early insipidities show only a capacity for rhyming and for the metrical arrangement of certain conventional combinations of words, a capacity wholly dependent on a delicate physical organization, and an unhappy memory. An early poem is only remarkable when it displays an effort of reason, and the rudest verses in which we can trace some conception of the ends of poetry, are worth all the miracles of smooth juvenile versification. A school-boy, one would say, might acquire the regular see-saw of Pope merely by an association with the motion of the play-ground tilt. Mr. Poe’s early productions show that he could see through the verse to the spirit beneath, and that he already had a feeling that all the life and grace of the one must depend on and be modulated by the will of the other. We call them the most remarkable boyish poems that we have ever read. We know of none that can compare with them for maturity of purpose, and a nice understanding of the effects of language and metre. Such pieces are only valuable when they display what we can only express by the contradictory phrase of innate experience. We copy one of the shorter poems, written when the author was only fourteen. There is a little dimness in the filling up, but the grace and symmetry of the outline are such as few poets ever attain. There is a smack of ambrosia about it. Mr. Poe had that indescribable something which men have agreed to call genius. No man could ever tell us precisely what it is, and yet there is none who is not inevitably aware of its presence and its power. Let talent writhe and contort itself as it may, it has no such magnetism. Larger of bone and sinew it may be, but the wings are wanting. Talent sticks fast to earth, and its most perfect works have still one foot of clay. Genius claims kindred with the very workings of Nature herself, so that a sunset shall seem like a quotation from Dante, and if Shakespeare be read in the very presence of the sea itself, his verses shall but seem nobler for the sublime criticism of ocean. Talent may make friends for itself, but only genius can give to its creations the divine power of winning love and veneration. Enthusiasm cannot cling to what itself is unenthusiastic, nor will he ever have disciples who has not himself impulsive zeal enough to be a disciple. Great wits are allied to madness only inasmuch as they are possessed and carried away by their demon, while talent keeps him, as Paracelsus did, securely prisoned in the pommel of his sword. To the eye of genius, the veil of the spiritual world is ever rent asunder that it may perceive the ministers of good and evil who throng continually around it. No man of mere talent ever flung his inkstand at the devil. When we say that Mr. Poe had genius, we do not mean to say that he has produced evidence of the highest. But to say that he possesses it at all is to say that he needs only zeal, industry, and a reverence for the trust reposed in him, to achieve the proudest triumphs and the greenest laurels. If we may believe the Longinuses and Aristotles of our newspapers, we have quite too many geniuses of the loftiest order to render a place among them at all desirable, whether for its hardness of attainment or its seclusion. The highest peak of our Parnassus is, according to these gentlemen, by far the most thickly settled portion of the country, a circumstance which must make it an uncomfortable residence for individuals of a poetical temperament, if love of solitude be, as immemorial tradition asserts, a necessary part of their idiosyncrasy. Mr. Poe has two of the prime qualities of genius, a faculty of vigorous yet minute analysis, and a wonderful fecundity of imagination. The first of these faculties is as needful to the artist in words, as a knowledge of anatomy is to the artist in colors or in stone. This enables him to conceive truly, to maintain a proper relation of parts, and to draw a correct outline, while the second groups, fills up and colors. 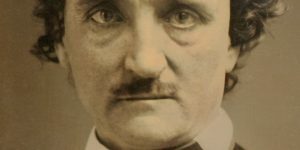 Both of these Mr. Poe has displayed with singular distinctness in his prose works, the last predominating in his earlier tales, and the first in his later ones. In judging of the merit of an author, and assigning him his niche among our household gods, we have a right to regard him from our own point of view, and to measure him by our own standard. But, in estimating the amount of power displayed in his works, we must be governed by his own design, and placing them by the side of his own ideal, find how much is wanting. We differ from Mr. Poe in his opinions of the objects of art. He esteems that object to be the creation of Beauty, and perhaps it is only in the definition of that word that we disagree with him. But in what we shall say of his writings, we shall take his own standard as our guide. The temple of the god of song is equally accessible from every side, and there is room enough in it for all who bring offerings, or seek in oracle. for such it practically is to him, with wheels and cogs and piston-rods, all working to produce a certain end. This analyzing tendency of his mind balances the poetical, and by giving him the patience to be minute, enables him to throw a wonderful reality into his most unreal fancies. A monomania he paints with great power. He loves to dissect one of these cancers of the mind, and to trace all the subtle ramifications of its roots. In raising images of horror, also, he has strange success, conveying to us sometimes by a dusky hint some terrible doubt which is the secret of all horror. He leaves to imagination the task of finishing the picture, a task to which only she is competent.